The Nine of Wands card talks of perseverance, trying repeatedly and refusing to take “no” for an answer. You have to continue despite fatigue, slow stamina, toughness and strength. If you are single, the appearance of Nine of Wands in a reading might suggest that you are careful with relationships because you might have been hurt in the past. 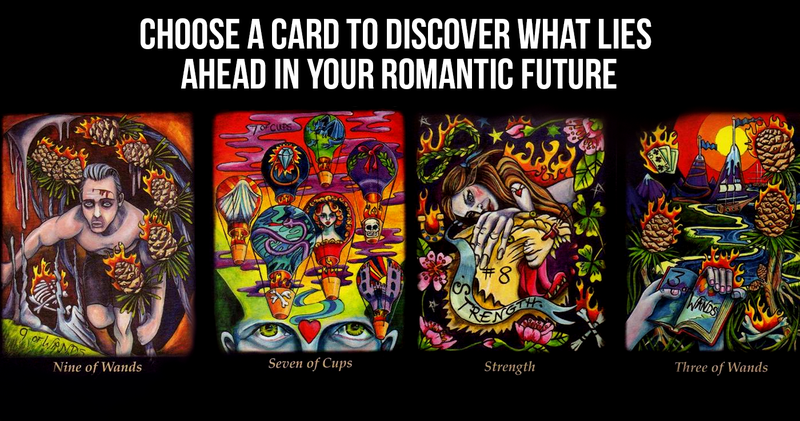 The Seven of Cups is likely to appear when temptation has wormed its way into your life. This card presents to us seven golden chalices each overflowing with a different object. The picture is quite chaotic and reflects the many different options that have appeared, or will soon appear, in your life. Too many options to explore may leave you feeling defeated, but this is rarely the case. The Seven of Cups is pointing out this flaw in your plan in order to encourage prioritization. 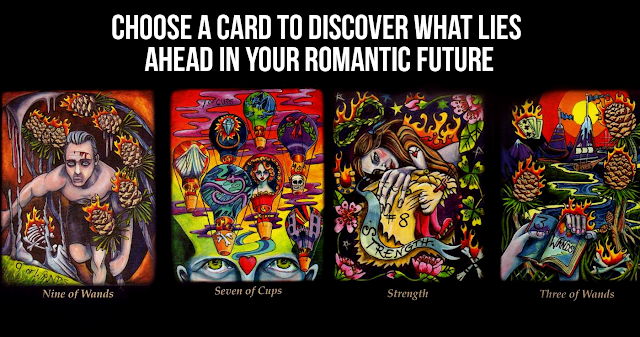 In a relationship-oriented spread, the Seven of Cups spells trouble. If you’re already attached, it means that you can expect some bumps in the road. At this time, it’s important for you to evaluate your relationship objectively. Are you being completely honest with your partner about your intentions? Strength is all about your ability to assert yourself in a diplomatic and constructive way. It is also about your own personal growth and coming into your own by taking the reins and directing yourself down your path without stepping on the toes of others. It is a very powerful card and is generally a good omen in your readings. If you’re already attached, Strength in a love oriented reading is a sign that your relationship has stability and room for both parties to grow together in a healthy way. The Three of Wands is a card all about making steady progress in your life. It does not promise instant results, but it does bring it with happy endings for those who are steady on their paths. When the Three of Wands appears in your relationship spread, it means that you’re in a good position to grow with your partner. It’s possible that you are on the verge of starting something new or learning something new about your partner.